Green lipped mussel growing under pure and clean environment of New Zealand contains variety of vitamins, mineral and lyprinol, anti-inflammatory agent. Lyprinol works by helping to manage the levels of compounds known as leukotrienes which causes inflammation. 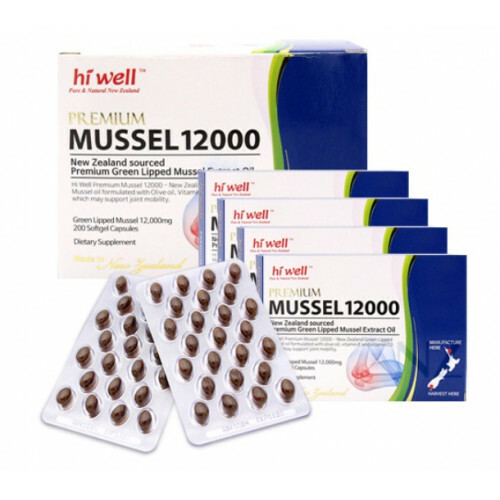 Hi well Premium Mussel 12000 only uses green-lipped mussels from pure and clean Stewart island (Big Glory Bay) located the end of New Zealand. The water temperature of the island is lower than other areas since it is close to Antarctica so that it is abundant in krill oil as well. You may expect the product to be supporting joint and cartilage health, lowering cholesterol level and boosting blood circulation. Adults : Take 1 to 3 capsules daily with a large glass of water or as directed by your healthcare professional. People allergic to shellfish should avoid using. If symptoms persists, consult your healthcare practitioner. Store in a cool dry place below 30ºC. Keep out of reach of children. ♦ Product Description Hi Well Premium Colostrum 1500 Chewable Colostrum benefits all ages and..
♦ Product Description Premium Colostrum Powder 100% consists of 100% New Zealand colostrums p..
♦ Product Description Hi Well Premium Colostrum 500mg capsules benefit all ages and promote t..